The workmanship of this item is impeccable. I can now cover my beautiful mixer and it will stay clean. Protect your KitchenAid mixer from dust, elements, and buildup with this quilted cotton mixer cover. This cover features thick quilting that cushions your mixer from exposure and keeps it safe until the next use. I ordered this mixer cover in Khaki. Received it in red sent it back. The second one came it was also red spoke to overstock they said they contacted the warehouse but once again I received a red cover. Overstock was great with sending back. I do believe it was warehouse error. Did buy my cover elsewhere. 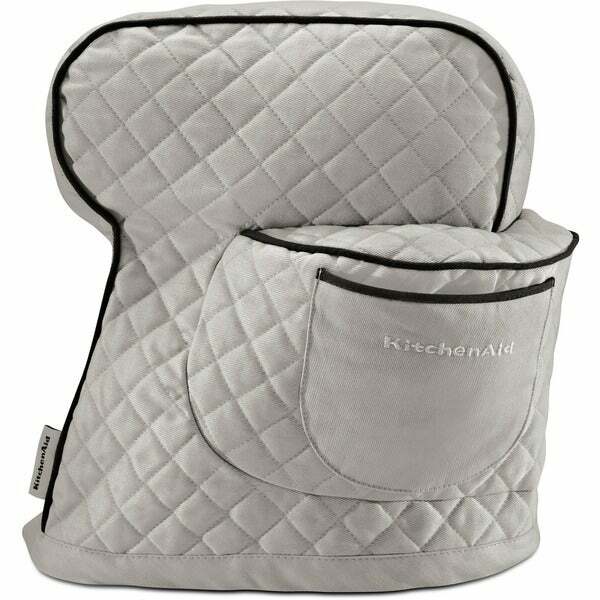 I love this kitchenaid quilted cotton tilt-head stand mixer cover! It’s very durable, and fits perfectly for my kitchenaid. I would recommend this to anyone that want to protect their stand mixer. It’s a great product. Well, I love the cover, but hadn't realized it was for a tilt=head mixer so it was too small for my lift KitchenAid and I had to send it back. I must say... I really, really liked the quality of workmanship on the cover I had to send back. One thing I will mention is the young man who helped me over the phone get my return processed was a very polite and kind young man... and all we did was CHAT...but trust me, I can tell the tone of the words used that this young man was great in Customer Service! Above and beyond politeness! Thanks! Fits my daughters KitchenAid perfectly. She had wanted a red one to go with her kitchen, and that color never seems to be on sale, so purchased this cover in red and it does the trick! We purchased a rose gold colored KitchenAid and when she uses the red cover - voila - goes with the kitchen perfectly. Red is a very true, apple red. I really liked this cover but it did not fit my stand mixer even though it is a 5 quart mixer. It was very disappointing that I had to return it. I waited until this cover was on sale, in red, as I love my mixer, but want it covered when not in use. Good quality and fit (without guard cover) and color true red. This is a brilliant idea! I tend to bake more in the winter than in the summer. The to see my mixer sit there and collect dust but since I bought this cover, it keeps my mixer clean and ready for my next use. Love it! I ordered a Red cover to cover my Red mixer, kind of color coordinated to the kitchen colors. A black one was shipped and received. Wife decided to keep it anyway and it fits nice and looks good. This was a very good accessory for my Kitchenaid Artisan Stand Mixer. It is a perfect fit and keeps my mixer protected from dust and grime. It cleans very easily and nicely. Very happy with purchase. I love this! It came in much faster than I had anticipated which was an added bonus. It fits my mixer perfectly and looks good on my kitchen counter. I had recently had my kitchen cabinets repainted and when I started putting my things back I realized that having the mixer out on the counter would make more sense so it needed to be covered if I was going to leave it out. Looks great! I like the cover a lot, it fits perfect on my mixer. The red color looks good in my kitchen with my other accessories. NO MORE DUST ON THE MIXER! Love it. Fits perfectly and holds all the pieces to give the counter a clean look. Love it! The cover serves its purpose. However I do wish that the pipping was grey instead of black. I like the item itself but the company kept making mistakes with the color. I never got the red color that I ordered and kept returning it only to keep getting every color except the red . "Will this cover fit model ksm150psmy?" I chose this cover to protect my KitchenAid Mix, which is an expensive kitchen appliance. "does it cover the mixer with the plastic pouring shield still on?" Unfortunately jtad4111, this cover would not fit over the pouring shield. Item number 12438465 may be able to fit the pouring shield in the side pocket. I hope this helps, thanks for shopping with us. "This cover fit 6qt stand mixer?" This cover only fits the 5-quart tilt-head mixer. Yes cindi1129, this cover will fit both the 5 and 6 qt mixers. Thanks for shopping with us.